In the issue “Alternatives for the Health-Conscious Individual” by Dr. David Williams, he talks about some interesting research in vibrations. He says that researchers have found that vibrations or energy currents in the range of 20 to 50 Hz stimulate bone growth. The production of the body’s natural anti-inflammatory compounds is increased. Joint pain and swelling improve. Bone fractures heal faster, and weakened bones begin to strengthen and rebuild. “Some of the most amazing research that I’ve run across, however, deals with cats. A group called the Fauna Communications Research Institute in Hillsborough, North Carolina recently started some very interesting research focusing on the possible connection between vibration frequencies and healing. Cats also purr when they give birth and when they are under stress, caged, or severely injured. Since purring expends energy, it makes sense that there would be a reason for it. Hip dysplasia, arthritis, and ligament and muscle damage are all common to dogs, but almost non-existent in cats. Even myeloma, a cancerous tumor in bone marrow, is practically unheard of in cats, yet quite common in dogs. 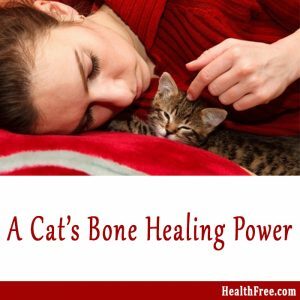 Any vet will tell you how much easier it is to fix a broken bone and how much quicker one heals in a cat compared to a dog. 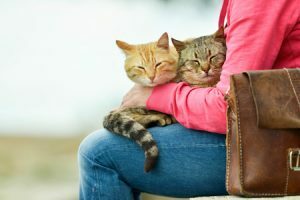 Researchers at the Ontario Veterinary College in Canada made some interesting comparisons between dogs and cats regarding their complications from elective surgeries. They found that complications from castration were as much as 20 times higher in dogs than in cats, and the postoperative problems following ovariohysterectomies occurred twice as often in dogs as cats. Breathing problems associated with heart disease are almost non-existent in cats but common in dogs. Large skin-tissue grafts take quickly in cats but often become necrotic in dogs. Historically, bone cancer is extremely rare in cats, but common in dogs. And the list goes on and on. Purring appears to be a cat’s way of treating itself. Just like humans use shivering to warm the body, cats may purr at specific vibration frequencies that promote healing in various parts of their bodies. 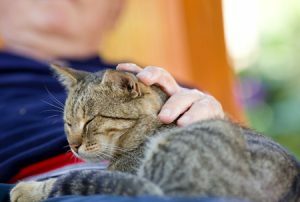 While the researchers in the above-mentioned unpublished study found that a cat’s dominant purring frequency might be at 25 Hz or 50 Hz, the range extended up to 140 Hz. By changing the frequency of their purring, cats may be fine-tuning their healing abilities. What can you do for your cat? Read here!